Silver Necklace with two handmade discs in 18ct Yellow Gold and Sterling Silver. The Xilitla collection was inspired by a visit to a magical place called 'Casa de James' in a Nothern town in Mexico, built by an English man during the 1950's. James recreated the petals and leaves of Orchids in concrete, scaled up to monstrous proportions. This capitivating and lively environment inspired Corinne's textured collection which was modified to a plain style to suit the fashion consumer whilst in keeping with her organic style. 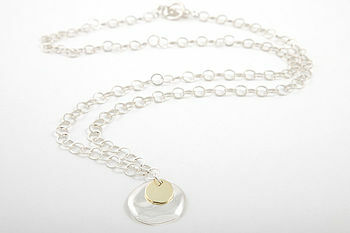 Corinne continues her love of integrating Silver with Gold, creating a collection that is artistic and strong. 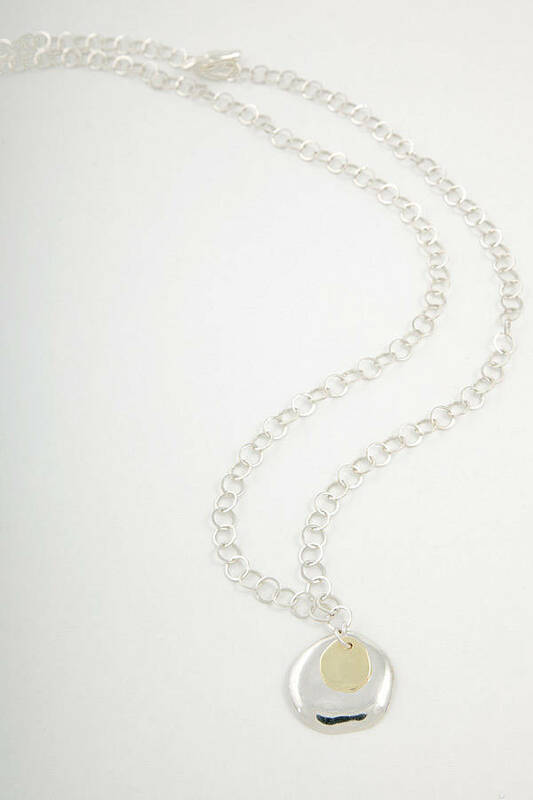 Length of pendant is 66.5cm. Dimension of large disc is approximately 2.4cm and dimension of small disc is approximately 1cm. This product is dispatched to you by Corinne Hamak.